By 3 pm we are in our tents at Camp 2, eating, drinking, fighting alternating blasts of sun and clouds bringing drafts of cold air and spindrift. Bunter is holding the fort at Base Camp and updates on the weather, we either have more wind and less snow or more snow and less wind. I've been studying graphs for days - finally choose our summit day. The weatherman recommend otherwise, but after 15 seasons in the Himalayas, I look up at the sky, talk to the Sherpas about Lucky Lama days and we go anyway. At dawn the next day light creeps slowly into the tent. It is 4:30 am and we have learned to adapt to the mountain - it certainly won't adapt to us and we have to suffer just a little if it will allow us to pass. We put on our down suits, completing our armor, puffed out against the frozen air and wrap our hoods around us. Mark has now descended from Camp 2, and Ron from just above, while Adele, Jim, James and I continue higher. The climb up the first rock band takes 4 1/2 hours - on Everest I would have been at Camp 3 already, but here we have another 3 hours to go. 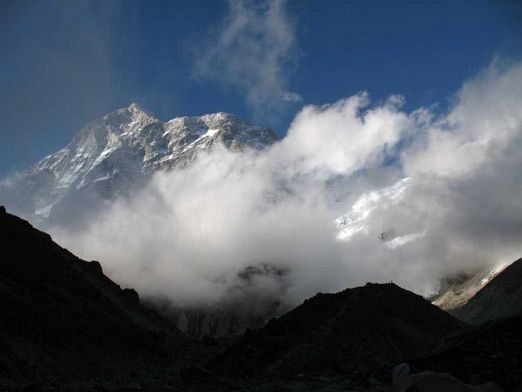 Makalu is not kind to anyone looking for well spaced camps, you very much sense it is a mountain unto its own. At the Makalu La (pass) we cross into Tibet and the wind and snow that has been building blasts at our backs, pushing us across to Camp 3. We pitch a tent that flaps wildly, inverting like an umbrella before we flatten it back into shape and stomp it into the snow, tieing it down with rocks that hopefully will keep it from ballooning away with us inside. With the cross into Tibet, the radio goes silent, and soon even the sat phone is confused into silence. We are cutting our ties with the world below. Morning three dawns slowly, sun on the tent warms it to a toasty, steaming hovel, ice melts and drips from the ceiling down the backs of our necks. We step out into Tibet, bright sun and the hovering peaks of Makalu. James comments "This is the most amazing place I have seen." We are well above Tibet and Nepal has disappeared below, we have entered a space of higher earth; ice and rock and sky with clouds above and below us. To the east, only the towering granite towers of Makalu are all that exist rising in a huge wall. Camp 4 is on a rocky promontory, orange boulders surround us, then drop off in a cliff to the blue ice, blasted smooth by the winds. The afternoon passes slowly, drinking, the tent flapping, spindrift building up. We check all the O2 bottles, have a final cup of tea, darkness settles in, the wind blasts, it always blasts this time of night. Be calm, wait, then it slowly settles. At 9 pm the moon is a bright halo casting shadows. We are outside in down, oxygen masks, headlamps, isolated from the cold world which forces our thoughts inside. The crunch of crampons on ice, the whoosh of O2, we go up and cross into the ice seracs, creeping over crevasses and under ice cliffs that in our headlamps glow deep blue. The snow is being painful; crusty, ankle deep, knee deep, ice, sugar and then crusty again and repeat 1,000 times. A thin line of blue signifies the beginning dawn. We sit on the ice below the French Couloir and watch the sky lighten, Everest glowing blue, a plume softening its ridges, little more than 20 km away. The Kangshung Face, so well-known from my ascent long ago falls away below in rolls of snow disappearing into the black rock below. The French Couloir starts quickly, a natural left turn leading to the rocky ridge high above on the skyline. It is now full light, the Couloir quickly disappears into rocky cliffs. A few fixed lines, frayed to the size of shoestrings are followed, but we quit using them and just climb, trusting our crampons and solid granite under our fingers. 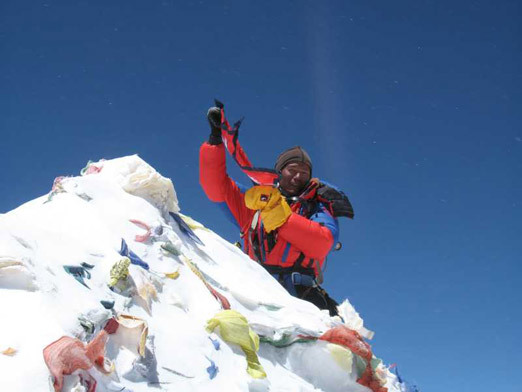 There are so many fixed ropes on 8,000 meter peaks, it is good to grasp and climb up solid rock and ice without any other outside support, weaving our way up the ridge. At 8,170 meters, Jim turns around, the way above looking long, the way down looking a better alternative. 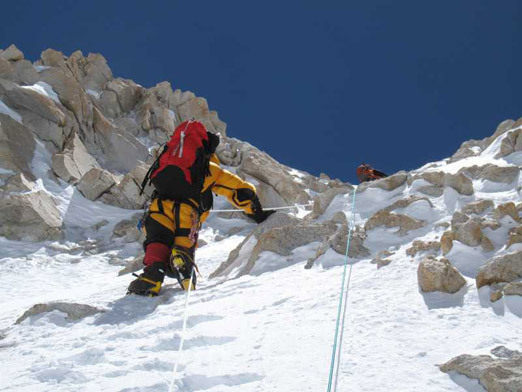 The mark of a good high-altitude climber is knowing when to go up or go down; it is not a forgiving environment. Now we are still climbing the ridge, and climbing. It is fun, but long. Adele, James and I are together with Lakpa and Dawa. 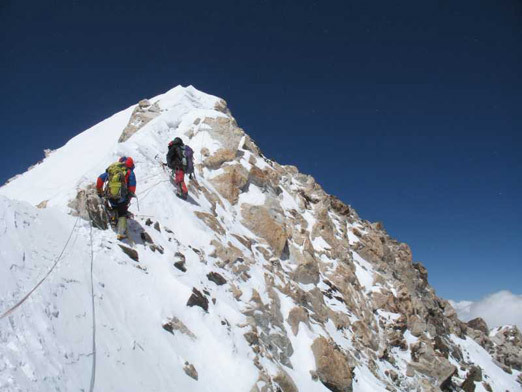 We weave left, climbing unroped up through rock bands and snow out onto another ridge, passing through 8,300 meters. There is no real earth below, only clouds and floating mist. Now we will only go up. The final summit pinnacle rises up at the end of the icy ridge. We loop a few frayed fixed ropes together, I smash in a snow stake through the snow and into hard ice. It feels kind of solid. 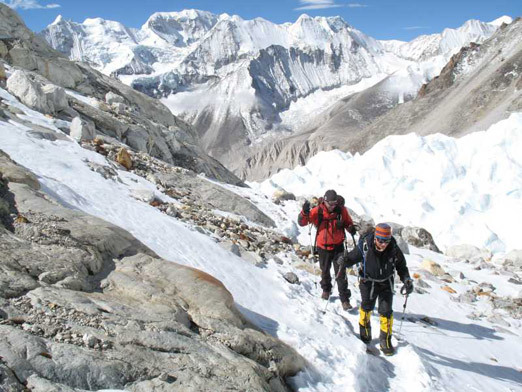 We loop around a rock tower and straight up to what looks like the top, should be the top, but no, a last weaving curling ice fluted ridge curls higher and we sneak across snow falling away below our heels hanging back over the two and a half kilometers back to Base Camp. The summit is a perfect triangular snow cone held up by white granite. It holds half a big boot, the other balanced below. The top is as good and spectacular as it had looked a year ago from Everest, a perfect granite tower with a tiny bit of snow closer to the heavens above than the earth below. We are all squeezed up at the end of the summit ridge, touching the top. As I adjust my camera, it strips skin from my fingers like knife cuts; seems it is a bit colder than the blue sky indicates. 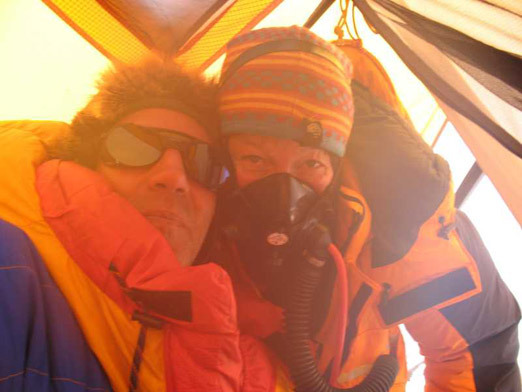 The summit happiness, the smiles bigger than oxygen masks are coupled with the thoughts of getting down, while standing seemingly at the edge of space. But down goes quickly, the mind now accustomed to the steepness, tiredness balanced with the joy of the ridge leading down, rappeling into the French Couloir and dropping out the bottom onto the snow slopes and seracs below. We rope up and weave down through the crevasses, legs weary and minds happy. We are back in the tents 19 hours after we left, 14 hours up and 5 hours down, climbing through the night, the morning, the day and into the afternoon. It is good to know there are still big relatively remote adventures in the high Himalayas to be had for the people with big hearts and spirit to undertake them. 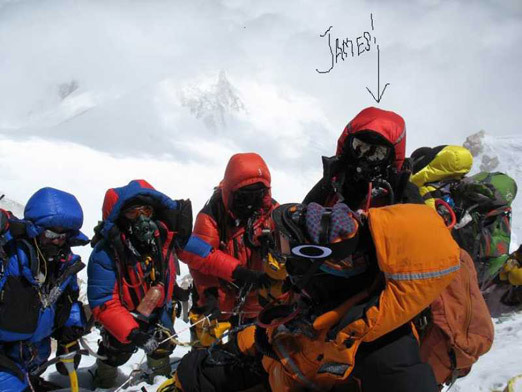 Climbing the world's 5th highest mountain, via the North Face and North West Ridge. * A hearty congratulations to Robert's team for a safe and successful summit. Robert is one of Lowa's field ambassadors. 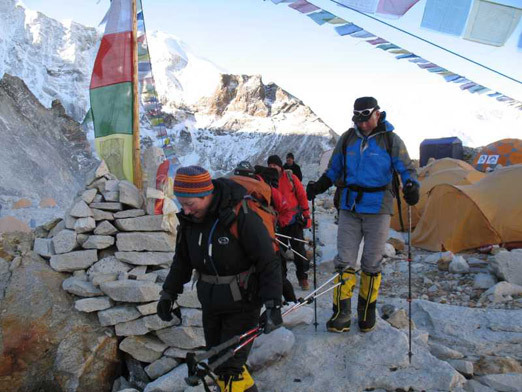 His team was outfitted with the LOWA Expedition 8000 RD GTX®. To read more of Robert's dispatches, visit Jagged Globe. Nothing like the perfect terrain to test how far the best combat boots would go, right?